This image is a composite selfie taken by MAVEN's Imaging Ultraviolet Spectrograph (IUVS) instrument that normally looks at ultraviolet emissions from the Martian upper atmosphere. Lines are sketched in to show approximately where components of the spacecraft are that were not able to be imaged due to the limited motion of the instrument around its support boom. Thrusters can be seen at the lower left and right, the Electra communications antenna at the bottom toward the left, the magnetometer and sun sensor at the end of the solar-panels at the upper left, the tip of the communications antenna at the top middle. In addition, the shadow of the IUVS and of its support boom can be seen down the middle of the spacecraft body. 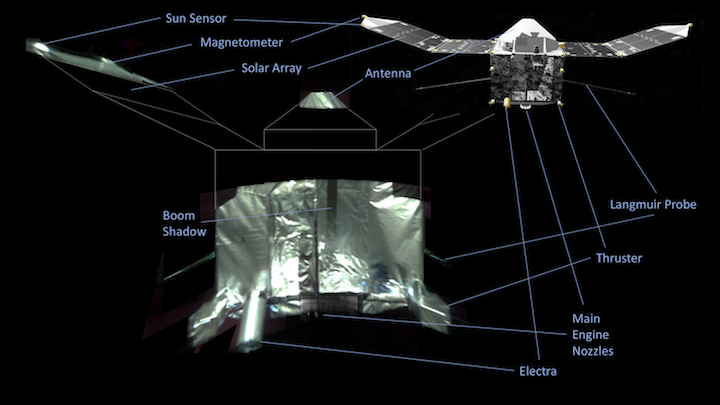 This image identifies the various parts of the MAVEN spacecraft selfie, with an artist's sketch of the spacecraft for comparison. Individual components are identified in both the selfie and the computer image. 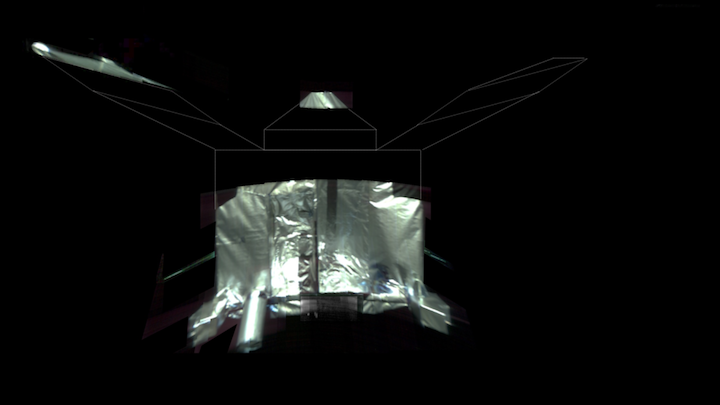 Notice that the computer-generated image shows the IUVS instrument, but that it is not visible in the actual selfie (because that’s what’s taking the picture!). This image shows part of the MAVEN spacecraft and the limb of Mars in the background. This is one of the individual images that make up the selfie, showing the magnetometer and sun sensor at the end of the solar panel. Mars is seen in the background; the dark spot at the top of the image is the Olympus Mons volcano.